Mark & Aisling's Am-Asian Adventure!!! : 7th Stop: Bangkok again! Moving on… the next day we had a spring in our step again, so decided to go and do touristy things. First of all we booked our tickets to Ko Tao for next week (we were very organised!) and then jumped in a tuk-tuk to Wat Phra Kaew. When we arrived, there were people around the entrance telling us it was closed. They didn’t look very official though so we walked around to another entrance, and sure enough we saw people going in. When we got there, we were told that our pants were too short and we’d have to rent out some long ones if we wanted to see the palace. We agreed (even though they were big hilarious clown pants! ), seeing as it was the only way we were going to get in. Finally we made it inside, only to be herded straight out again along with all the other tourists! Nobody was being told what was going on, just to move along to the exits. We were raging! We couldn’t come here the last time we were in Bangkok cause we didn’t have time, and now we're finally here and we’re being herded out straight away! And, we were made pay to rent out pants!! That was the worst part. The people outside knew that everyone was going to be told to leave but they still made us pay to get long pants. We were so annoyed that we did what anyone would in the situation… that’s right, we stole the pants! We were meant to drop them off where we got them on the way out, but we just threw them into our bags and legged it! They’re hideous (actually, the sarong that Ash got is quite nice) but they’re a medal of our victory over Wat Phra Kaew! There’s a lesson for you, don’t mess with us or we’ll steal your pants! To celebrate, we went to a nearby shopping mall and found a place that did killer crepes! Ash claims they’re the best she’s ever had! We were going to go to the cinema there too, but they only had like two screens. Instead we went to Jim Thomson’s House. It’s not, as the name suggests, just some guy’s house, it’s a Bangkok tourist attraction, and it was really nice actually. Jim Thompson was an American who developed the Thai silk industry and his house is now open to the public. 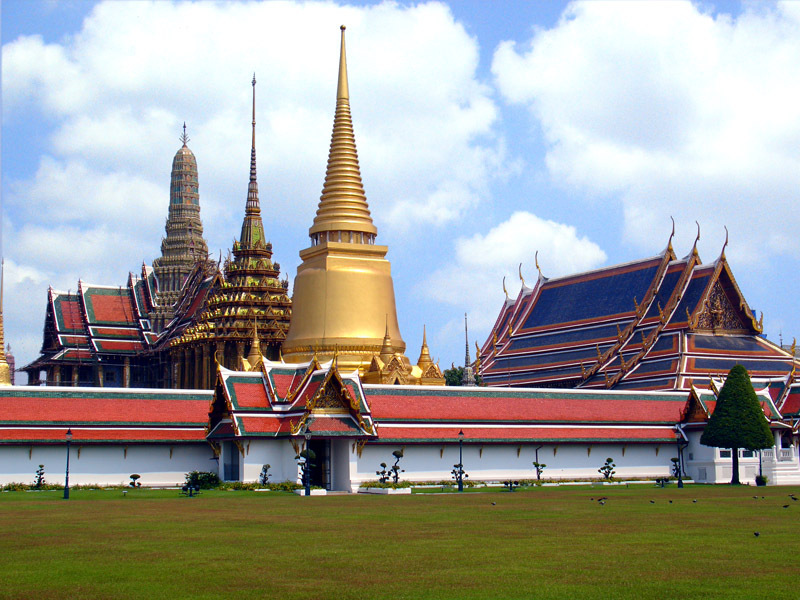 It’s full of Thai sculptures and artwork and all that kind of lark. Well worth a look though. Ok, I can’t really remember what we did the day after… I think we just chilled by the pool again and took it easy as we had planned a trip to Ayuthaya for the next day. It was sunny though! I remember that much! We probably watched some Amazing Race too that day… who knows!? So, our day in Ayutthaya... now, before we started planning our trip around SE Asia, neither of us had ever heard of Ayutthaya, it wasn't a place we had ever intended going to. 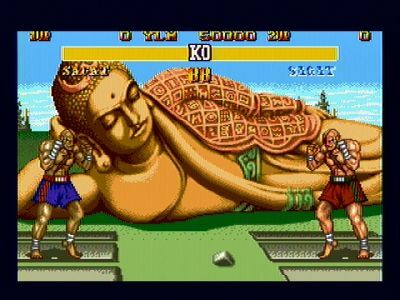 But, if there are any Street Fighter fans out there, you will know that Sagat's stage is in front of a big reclining Buddha in Thailand. So, I made it a mission to find out where this was and go and see it. And that's where our day trip to Ayutthaya came from! It turns out that there was loads to see there too and it was, one of many, ancient capitals of Thailand, before it was destroyed by the Burmese army in 1767 (go on Burma!). We needed a big hearty feed that morning for the day ahead, so we forsook our regular breakfast spot and went to Cool Corner, where we got pancakes, fruit, a croissant, bacon and a milkshake all for 100 Baht (about €2.50). Breakfast bargain! We ended up going there for a lot of our meals over the next few days. The food was delicious, although the staff were shocking... We jumped on a bus to Ayutthaya and when we arrived, rented out two bikes for the day. Most of the city's ruins are located on the central island, so you had to get a little boat over and back, which is fine, unless you're carrying a bike over your shoulder! First on our list was Wat Phra Mahathat, which contains probably the most iconic image in Ayutthaya, a Buddha head engulfed by tree trunks. I don't know the story behind it, but most of the Buddha statues in the place had their heads chopped off, so I presume this was just one of them and a tree grew up around it. The heads weren't chopped off as a mark of disrespect though. Whenever the Thais were being attacked, they used to cover their gold statues in plaster so that they wouldn't look valuable to looters. The heads were simply chopped off by their enemies to see if the statues were golden inside! Actually, at Wat Thammikarat we were attacked by a pack of dogs! Well, I say attacked, they didn't actually touch us... but it was close! When we were locking up our bikes, about 3 or 4 dogs came out and started barking at us. We just ignored them and walked on. As we were walking though, dogs just kept coming out of nowhere until we were completely surrounded by a good 11 or 12 barking dogs! I'm not even afraid of dogs but I was getting a bit unnerved at this point. We walked along as calmly as possible, trying not to turn our backs on any of them, and we finally made it out to a public area. As we were leaving the place, I had to go back and get a picture of them for our records, to show how vicious they were. I said I'd take it as I was cycling past, just in case they came at me again, but as I went by, there wasn't a peep out of them! They were just frolicking on the grass! They obviously knew my plan and were trying to make a fool out of me. Well, it worked... Here'a a photo of some happy dogs! We then headed over to Wat Phra Si Sanphet, which was pretty nice, but ended up being by far our favourite temple of the day, cause we just went around taking pictures of Frankie in various locations. He even made friends with a local puppy who was following us around! We also took photos of him hiding in trees. It's like 'Where's Wally?'! We then went to find our reason for coming to Ayutthaya in the first place (well, my reason for coming here...) to see the reclining Buddha! It was located at Wat Lokaya Sutha, and actually wasn't one of the big tourist attractions here at all! (Can you believe that?!) In fairness, we've seen a lot more impressive reclining Buddhas on our travels, but seeing it, for me, was more about what it represented, rather than what it looked like (and when I say "what it represented", I'm talking about Street Fighter, not on some spiritual level...). It was getting late at this stage so we had to cycle back and look for a ferry off the island. We couldn't find one anywhere though! We came across a few different piers, but after lugging our bikes down onto the platform, we were told that we were in the wrong place. Nobody could seem to tell us where the right place was though! We cycled along from pier to pier with no luck, until we came to this platform floating on the water, connected to the shore by a thin plank of wood... We thought there's no chance this is the right place, but a guy on a boat called out that he'd take us across. There was no way we were going to be able to get our bikes across that tiny plank onto the pier though, not a hope! And so onto our last day in Bangkok. We headed to the Siam Paragon cinema to see Unstoppable and we noticed that there were special prices for Wednesdays! Result! When we were paying for our tickets though, we were charged the regular price. We didn't want to cause a fuss so we just went with it. (We later realised that today was Thursday, not Wednesday... we really have no concept of days anymore!) The film wasn't starting for a few hours so we had some time to kill. We went over to the nearby Erawan Shrine, which was grand but nothing to write home about (ironic, seeing as I am writing home about it now...). We then made our way to Crepes & Co, a creperie that Aisling had read up about, which claims to be the best in Bangkok. Now I don't know of any other creperies in Bangkok, but it was incredible! I'm sure you can see what I mean from the photo. It was like a work of art! We made it back to the cinema just in time for the film but were stopped at the entrance because there were crowds of people there welcoming the king for some 'violence against women' day. (I'm not sure if he was for or against it...) Why they were holding it at the cinema too is beyond me! We made it in 25 minutes after the start time, but thankfully they were still showing trailers! We arrived in just in time for the national anthem which apparently they play before every film in the cinema, along with a montage of the king. Everyone had to stand up as well! It was very strange. The next morning we got up early to go straight to the travel agents. They didn't know what hit 'em! We made sure they sorted our bus and ferry to Ko Tao that night, and on top of that, we made them pay for our hotel room the night before, cause it was their fault we had to spend an extra night in Bangkok! They messed with the wrong people! They're lucky we didn't steal their pants too! Speaking of which, seeing as we had an extra day in Bangkok, we decided to head back to Wat Phra Kaew to see the palace! When we got there, once again there were people telling us it was closed, but we found another entrance that was open (We had read in the Lonely Planet about a scam where people will tell you that an attraction is closed, but offer to take you somewhere else in their tuk-tuk...). This time the place actually was open so we finally got to see the palace! And we had our own long pants too so didn't need to buy any! Also, keeping with the Street Fighter theme, M Bison's stage was outside Wat Phra Kaew, so that's two I've seen in the space of a few days! After looking around the palace, we went to a cafe and got two coconuts, (they seem to sell them everywhere here so we said we should really give them a try). They're not like the normal coconuts you'd see though, the brown hairy ones, they're green and fleshy. They just hack them open with a machete and serve them up with a straw. They're not really that nice either... we were less than impressed. To round off our last (hopefully!) day in Bangkok, I talked Aisling into going to a fish spa with me. If you've never heard of a fish spa, you're in for a treat! It's basically a place where they have big tanks of water, filled with what they call 'doctor fish'. You put your feet into the fish tanks and the fish eat off all the dead skin! It was the weirdest sensation I've ever felt. It felt kinda nice and ticklish, until you actually looked down to see that you were literally being eaten alive by hundreds of fish! Putting your feet in first was the worst part, when you got used to it, it wasn't so bad. And afterwards your feet were all lovely and soft! Aisling wasn't too keen at first but she enjoyed it in the end! Thankfully, that night everything was sorted for the bus and ferry and we finally left Bangkok behind. Next stop, Ko Tao for some seaside fun!